Wood is an organic product – no two boards are alike – so you will see variations in grain patterns, mineral streaks, shading and some knots. Some species have more of these characteristics than others. How much character you should expect also depends upon the type of wood chosen, as higher grades are more uniform. If the Cabinet has a stained finish as opposed to a clear finish, the boards will appear more uniform in color and grain. Natural color and grain is part of the beauty of wood, and one reason it makes such a desirable addition to your home. It is important to realize that the beauty of wood cabinetry comes from the natural qualities of wood itself. 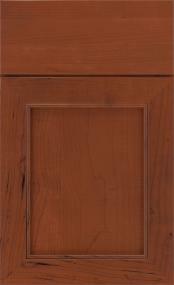 Our cabinets utilize only select solid hardwoods and hardwood veneers. The beauty of these genuine woods lies in the variation of the grain. The textures of those natural grain patterns often remain visible with paint finish and should be accepted as inherent characteristics when selecting painted cabinetry. On wood products, normal movement is typical due to changes in climatic conditions; this will cause hairline cracks at stile and rail and panel joints. This hairline cracking is a normal characteristic of painted finishes and will not be considered a reason for product replacement. Over time, there may be a slight color shift in the paint finish due to the continued exposure to natural and artificial light sources. Opaque finishes are different from standard wood finishes. On all wood products, expansion and contraction are typical due to changes in climate conditions. Due to this normal movement, opaque finishes may develop slight separation lines, finish breaks and seam lines. These will be most notable at stile, rail and panel joints. Joint separations may become more noticeable over time and through season changes. All MDF and wood opaque finishes first receive a primer coat designed to provide optimum fill and leveling of the surface. This provides an even base for the color and finish coats. Seam lines and finish breaks are normal characteristics of opaque finishes and should not be considered a reason for product replacement. Over time, there may be a slight color shift in the finish, due to exposure to natural and artificial light.